How does the Finnish legend of Santa differ to the Coca-Cola version we’re used to? It’s exactly the opposite to the American Santa Claus. In Finland he was a really scary guy with horns and scary clothes, and he came to people’s houses at Christmas demanding presents for himself. People gave him gifts so he wouldn’t take their children away. In Rare Exports, there’s a lot of things that are from the original myth but of course I invented a lot around it. So it’s a combination of original myth and my fantasy. The film seems to have everything – horror, fantasy, comedy, family drama. Was it difficult juggling so many elements? Actually I never thought of it as mixing anything – it just came very naturally to me when I was writing it. And I’m really glad people seem to have trouble trying to label it – because you can’t label it! It’s nice to have something original. Yeah, definitely, that’s the cornerstone of my style. I like to make it real, sincere, with heart and not make it easy. It’s a lot more fun if the subject is weird and you do it with a straight face! How easy was it to adapt your original short films into a feature? It was quite hard. Writing was the most challenging thing because I’m not really a writer. At some point I realised I had so much back-story that it would actually be much easier to do the film about that back-story. I think Steven Spielberg is my main influence, especially E.T, Close Encounters of the Third Kind and films like that. Of course, I watched Gremlins and The Goonies and things like that, but mainly I think I’m influenced by Spielberg’s films. The endearing characters are a big part of Rare Exports’ charm. Were they based on anyone in particular and was there an autobiographical element at work? Probably the characters are pieces of everyone I know. But I think the main character of Pieter is based on myself and how I was as a child. It draws on when I was young and wanted to be a movie director; people used to say, “What the hell are you talking about?” I liked that Pieter was an unlikely hero. The translation uses a lot of charmingly old-fashioned phrases such as “Fiddlesticks!” and “Blooming hell!” Do you know if that was an intentional attempt to reflect the dialogue in the original Finnish language? It’s hard for me to say, but the biggest difference in the Finnish version and the English subtitles is the bad language. There’s a lot of bad language in Finnish, and they have now smoothed it out. I guess they had to do it for the rating. I was quite surprised at how much they have toned it down when I saw the version in London a few weeks ago, but I guess they know what they are doing! I’m now writing a totally different kind of movie, but I do have an idea of what the sequel would be. 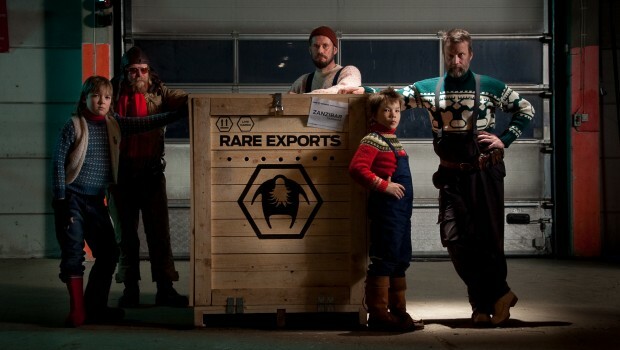 If Rare Exports is a hit, I’d need a huge budget for the second one – the idea is really, really big!